A sandwich shop owner in Forest Park said that he doesn’t buy all his vegetables from one vendor. By “not putting all his eggs in one basket,” so to speak, if one vendor goes out of business, he already has another in place who can take up the slack. If one starts providing less than acceptable produce, he has an alternative. The CROP Hunger Walk known as Hunger Walkathon West—centered in Oak Park, River Forest, Forest Park and Austin—gave Housing Forward a check for $3,000 in 2015, which was especially helpful since the gridlock in Springfield over the budget has prevented the PADS emergency shelter program from receiving $38,000, which is 22 percent of its annual budget. The gift from CROP is less than 10% of the revenue shortfall, but its significance is important. If Housing Forward put all its eggs in the basket called the State of Illinois or the Federal Government, its revenue stream could be affected in major ways. The CROP Walk donates 25% of the money it raises on the first Sunday of every May to local agencies like Housing Forward, which allows the agency to diversify its funding, so that when one stream dries up, others can help fund the work until other sources are found or the dried up stream starts flowing again. What’s more, the diversification of funding makes both Democrats and Republicans happy, because it combines sources of revenue from both the public and private sectors. The PADS program is made possible by 1000 volunteers. The CROP Walk involves 400 walkers. Who is right: the Republicans who want the government to remain small or the Democrats who want the government to do even more? When Springfield (aka Madigan and Rauner) get its act together, the funding for PADS will back where it should be: i.e., some eggs in the government basket and some in the one called private citizens and foundations. Join us on the walk on May 1, 2016 to continue the work to assist people here and around the world. Sign-up today, click this link. As we approach Christmas Eve and the end of the year; we wish all of the people who have helped on the CROP Hunger Walk; who have followed us on Facebook, Twitter and this Blog; who care about the issue of hunger: a most joyous holiday season. Whether your are Christian, Jewish, Muslim or Secular, all of you who walk make a difference in the lives of our fellow citizens. In 2016 we plan on more information about the walk and those whom we help. The following photographs are some the presentation of the money you helped raise for some of our local agencies. One of the results of the CROP Hunger Walk is the ability to provide 25% of what we raised to local agencies. This is just one of the 8 local agencies we were able to give a check to help their efforts in the community. 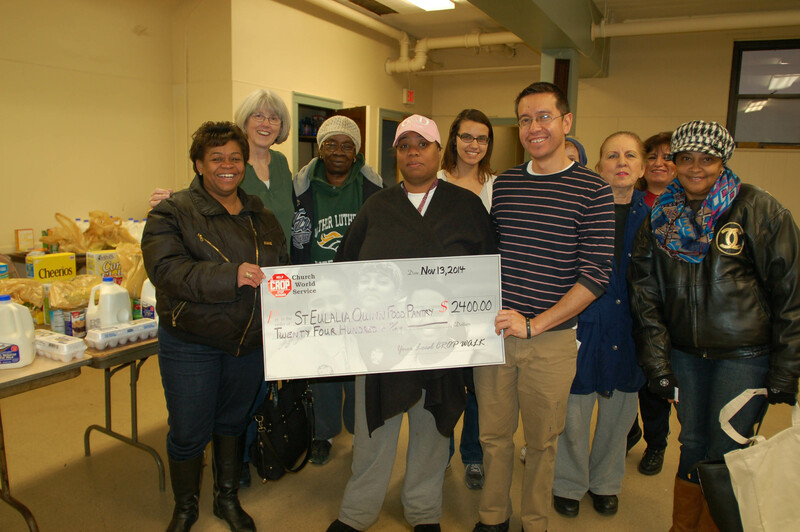 Here we present a check this past year to Gabe Lara, Director of St. Eulalia Quinn Center Food Pantry with staff and recipients of their good work in providing food to them. Ending Hunger One Step At A Time is our tag line but it also what provides these funds. Please join us May 3, 2015 to make a difference of the lives of our neighbors and people around the world.